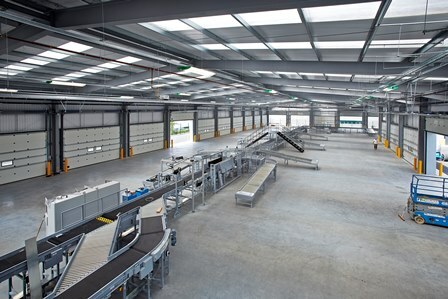 This new distribution centre for Geopost was constructed on the brownfield site of a former warehouse. The L shaped building has a hipped roof and an unusually large number of doors – both of which resulted in a complex structure with very limited opportunities for bracing. 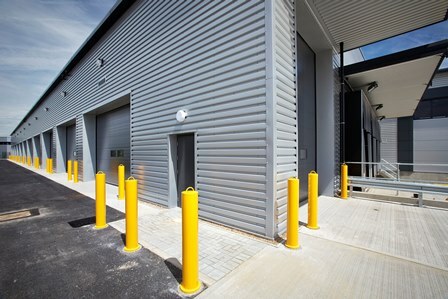 Flood risk at the site was also a concern so careful consideration was paid to the falls of hard surfacing to minimise rainwater runoff while restricting surface water on site to acceptable levels. A culverted river also bisects the site leading to special measures to bridge over for heavy goods vehicle access.